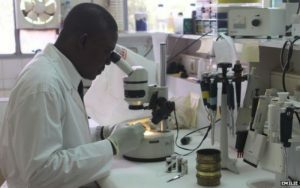 The Ministry of Health risks legal action from the Ghana Association of Medical Laboratory Scientists who have accused it of posting unqualified lab scientists to Ghana’s public health facilities. According to the President of the Association, Dr. Ignatius Awunibuno, about 30 percent of those posted do not have the technical competence for the job. Speaking at a forum in Accra, Dr. Awunibuno threatened legal action against officials in charge of postings at the Ministry of Health if they fail to correct the issue. “I want to sound a word of caution that it is getting to a point that we need to take certain drastic measures. We may have to take the legal option of getting the right things done. We may have to drag the mangers of these health institutions and the persons being posted to court for the court to take a decision on it,” he said. Earlier this year, Dr. Awunibuno raised the issue saying that the situation came to light after a survey conducted by the association. “I can say on authority that from a little survey that we did, close to 40% [presumably, more than the 30% that was mentioned] of the about 5,000 people practicing in our medical laboratories are not qualified,” he said. The post Health Ministry accused of posting unqualified lab scientists appeared first on Citi Newsroom.